The Prime Minister, Dr Manmohan Singh, said India would “test the waters” on the India-Pakistan joint mechanism and Pakistan would have to walk the talk. Was the IAF’s grounding of MiG-29 planes necessary? The Centre may adopt a go slow approach in deciding on the clemency petition filed by Mohammad Afzal’s wife Tabasum leading to the possibility of deferment of his execution on October 20. In a major development, Maharashtra’s Anti-Terrorist Squad (ATS) today arrested Asif Khan Bashir Khan alias Junaid, the suspected prime conspirator of the July 11 train blasts planned by Pakistan’s ISI, from Belgaum in neighbouring Karnataka. Shashi Tharoor, India’s candidate for the post of Secretary-General of the United Nations, yesterday withdrew from the race after South Korea’s Foreign Minister virtually assured himself the post with a strong showing in the Security Council’s fourth straw election. Although I did not win the race, it is a matter of genuine pride to me that I was deemed worthy by so many people and won the votes of so many governments. 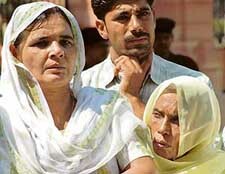 Convicted of murder, Jaj Singh and Gurwail Singh both residents of Bhitewad village (Amritsar), will be hanged to death in the high-security Central Jail, here on October 16, four days before the hanging of Mohammed Afzal, the man sentenced to death for attacking Parliament in 2001. Mr Justice H.S. Bedi, who was till recently Acting Chief Justice of the Punjab and Haryana High Court, today took over as Chief Justice of the Bombay High Court, the biggest High Court in the country. Chennai-born Indra Nooyi, who was recently appointed as CEO of global soft drink giant PepsiCo, has been named as the world's most powerful business woman by Fortune magazine, ahead of people like Oprah Winfrey and eBay chief Meg Whitman.